Do you know how to rename a Facebook Page when you need to make a change to your Facebook Page name? Whether you need to rename a Facebook Page because your branding has changed, you’ve spelled your business name wrong, or you just want to change your Facebook Page name, we’re going to teach you how to rename a Facebook Page. Why rename a Facebook Page? If you’ve read our list of 3 reasons to rename a Facebook Page, you know how important it is to have your Facebook Marketing strategy in place before you name your Facebook Page. While it isn’t impossible to rename a Facebook Page, the process can be a little stressful for some business owners because renaming a page requires going through a few steps and providing documentation to Facebook. By having a Facebook Marketing strategy, you can make the process to rename a Facebook Page easier. As we mentioned, some business owners may experience issues when trying to rename a Facebook Page. For example, you can rename a Facebook Page as many times as you like when you have less than 200 fans; however, once you have more than 200 fans, you have to submit a request to Facebook to rename your Facebook Page. If you have come to the conclusion that you absolutely need to rename a Facebook Page, we’re going to teach you how to rename your page. To rename a Facebook Page, follow the instructions below. Have you tried to rename your Facebook Page; however, you’re over the 200 fan limit? If you find yourself in this situation, don’t panic or create a new Facebook Page just yet. Instead, here’s a shortcut using the suggest an edit feature on Facebook. We’re going to walk you through renaming your Facebook Page using the suggest an edit feature, which should help save you time when you need to rename your Facebook Page. Once you reached 200 fans on your Facebook Page or you have changed your Facebook Page name one time, you no longer have the ability to rename your Facebook Page. This isn’t so bad unless you are going through a rebranding or you’ve spelled your business name incorrectly. If you’re in this situation, you are essentially stuck with the name you chose when you launched your Facebook Page. Fortunately, you can fix this issue and rename your Facebook Page with the help of suggest an edit on Facebook. Instead of creating a new Facebook Page, you can rename your Facebook Page with the help of the suggest an edit feature on Facebook. This feature also comes in handy because you can retain your Facebook vanity URL, keep your fans, and all of the content you have shared on your Facebook Page. 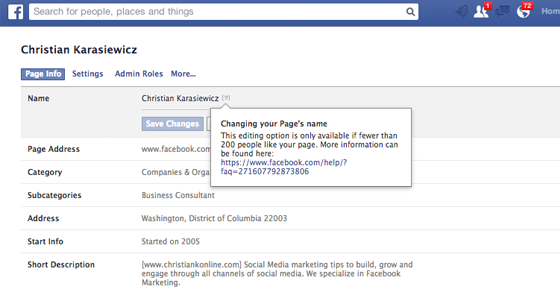 To use this feature, here are a few things to know when renaming your page. Now that you’ve done the preliminary work, here are the instructions you need to use suggest an edit to rename a Facebook Page. Note: Be sure you follow these exact instructions. Otherwise, it may not work for your page. If you are concerned about changing the category on your page, you can always change that part back. If you have ever been in the situation where you were considering renaming your Facebook Page, it’s not always an easy decision to make. We have compiled three Facebook Page branding tips to help you decide when it’s time to rename your Facebook Page.